We workshop with management to develop alignment and common understanding around likely market scenarios, evaluation criteria and option prioritization. We also help coordinate participant teams that furnish option information and complete evaluation criteria. Powerful yet easy-to-use web-based tools: we have move well beyond from MS Excel to bring the power of the web to growth planning. 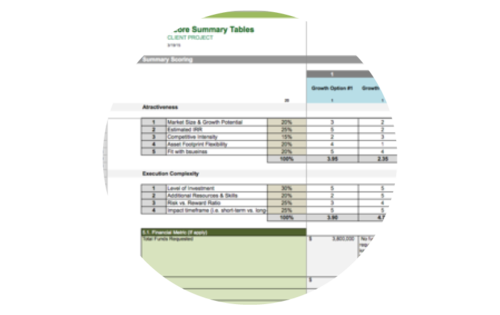 We use dynamic proprietary analytical tools to capture, evaluate and prioritize. Our secure, easy-to-use enhances team coordination, alignment and speed for decision making.